Serving is a way of sharing the love of God with others. Bible teachers need to get beyond simply teaching how to serve to the core motivation for serving. What about Children Using Spiritual Gifts? This seven page teacher training worksheet helps teachers determine what constitutes spiritual maturity in regard to ministry and then think through at what level students appear to be with a view to helping them get to the next level. 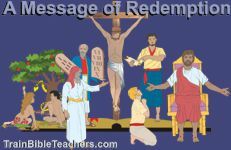 This worksheet can stand alone or be used in conjunction with the Teacher's Role in Discipling Students PowerPoint presentation as a break-out session or independent study.